General Tynamon’s plan is to use Madame Odius’ mallet and the Ninja Fusion Star to combine Skullgators into one MegaSkullgator to kill the Rangers. But Madame Odius says the Ninja Stars only respond to Rangers’ voices. 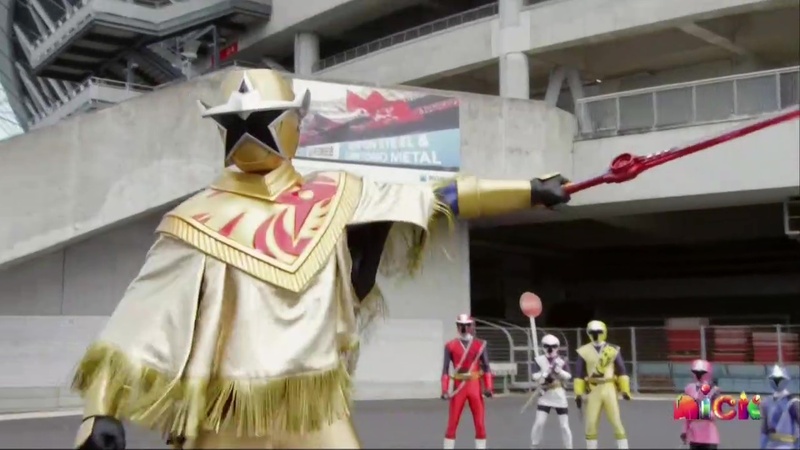 Down in the junkyard, Mick shows the Rangers the SuperStar Ninja Star which Levi can use with the SuperStar Blade. Before Levi can give it a try, Tynamon steals Levi’s voice and switches it with his own. Later, Levi asks Preston if he can undo the spell. Preston leaves to look through his spellbooks and finds a Dark Magic spell. He reluctantly gives it a try, but it turns Levi back into a kid. The alarms sound. The Rangers leave, but Levi can’t join them so he goes for a walk. The Rangers meet Tynamon downtown. 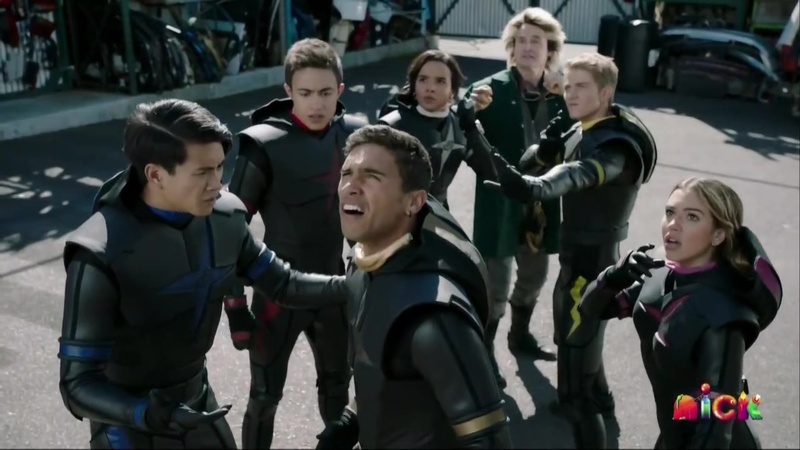 Tynamon shows them the Ninja Fusion Star, much to the Rangers’ shock. They realize this is bad knowing Tynamon has Levi’s voice. Cosmo Royale sends down six Skullgators and Tynamon combines them using the mallet and Fusion Star into Megamauler. 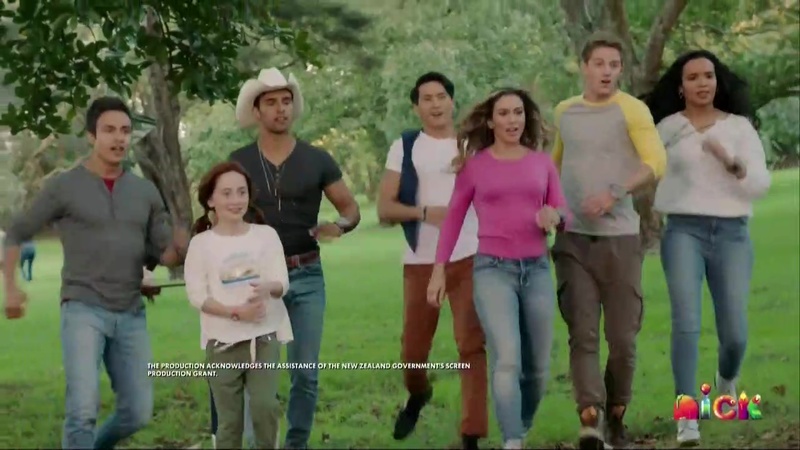 The Rangers morph and hop into the Ninja Steel Megazord. But Megamauler immediately forces the Megazord to break apart and eject the Rangers. They head back to the command shop to find the reverse spell. Megamauler tries to step on Tynamon, but Tynamon shrinks Megamauler down to normal size. Levi runs into some kids playing soccer and they laugh at his voice. A girl, Rosie, comes to his defense and the mean guys back off. Levi introduces himself as Hayden. Rosie says the other kids tease her about her red hair and never let her play ball. But she doesn’t let it get to her and sings her favorite song to cheer her up. Turns out it’s one of Levi’s songs and Levi feels very touched that his songs have so much meaning for people. Rosie’s dad texts her, so she has to go. She hopes Hayden can get better soon. Back at school, the Rangers can’t find a reverse spell. But Levi accepts that he can be a kid again. And how music is as much about lyrics than singing. Preston realizes something and he tries a Separation Spell. It turns Levi back into his adult form and returns his voice. Tynamon’s voice is back so he tricks Megamauler into going down to destroy the Rangers. The Rangers hurry out. They morph and Levi upmorphs to SuperStar Mode. He easily destroys Megamauler. Brody goes LionFire and the Rangers take on Tynamon. Levi delivers a SuperStar Super Charge Lightning Slash Final Attack at Tynamon. He drops the Ninja Fusion Star and Levi picks it up. Tynamon leaves. Cosmo Royal Gigantifies Megamauler. The Rangers hop into the Ninja Blaze Megazord and they decide to combine it with the Ultrazord to form the Ninja Blaze Ultrazord. They finish off Megamauler with a Firestorm finisher. Later, Levi finds Rosie and the Rangers decide to play soccer with her. The mean boys see it is Levi Weston and they ask if they can play too. Levi asks Rosie and she says yes. Rosie kicks the ball far and it knocks off Victor’s mask. He and Monty roll around in mud. I don’t know what it is, but there’s really such a lack of urgency or building up to a climax here. It’s already episode 17, only three more episodes left. But it feels like we’re not heading towards anything. And I believe next week is the Halloween episode, so maybe that’s one reason since having it pop up after a cliffhanger or something bigger would make no sense of course. But still, I really feel like we should be doing more exciting things by now. Not having more filler episodes. Maybe this might not be considered a filler ep since they got the Ninja Blaze Ultrazord for the first time as well as Levi’s Super poncho. But I think both should’ve been earlier and we should be seeing Madame Odius moving faster towards something by now. And we don’t. Still, this was an okay episode. Much more enjoyable than the earlier episodes. But it’s been a good three-episode stretch these last few weeks. I only wish we’d get to the endgame now. 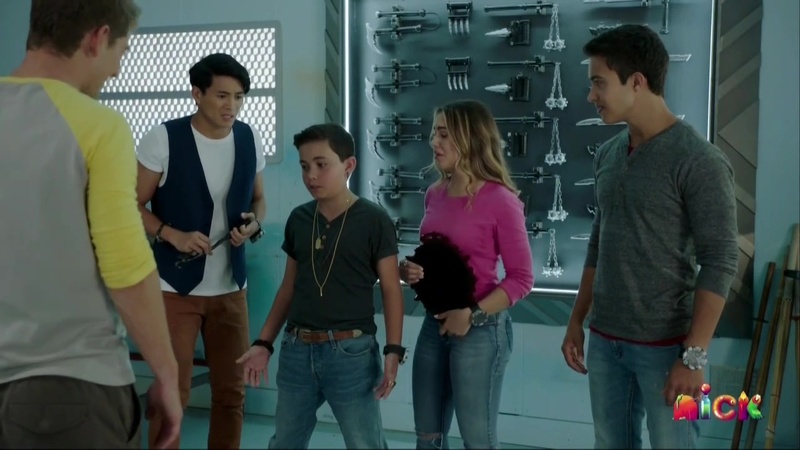 I haven’t been watching Power Rangers Super Ninja Steel lately after Preston asked Sandy to the dance instead of Sarah. So I couldn’t tell you what I think about the episode. It’s been better since then I think. Oh Really ok. Let me guest Preston and Sarah are going to get together after Sandy leaves. Nah, Sandy disappeared after that one episode. Like I’ve Preston and Sarah are going to get together right? You never know. There’s 3 episodes left. Plus the Halloween and Christmas specials. Oh Ok have you noticed anything between Preston and Sarah romantic feelings wise lately? What about before Sandy came into the picture? To me to be honest Preston was always interested in Sarah not Sandy. I can’t understand why the writers didn’t see that and just put Preston and Sarah together instead of Preston and Sandy together. Preston and Sarah had chemistry from the beginning of Ninja Steel and Super Ninja Steel. I can tell that Sarah was jealous and heartbroken over Preston and Sandy together in both OutFox and Love Stings episodes. But maybe the writers didn’t put Preston and Sarah together because they’ve saw a friendship there or maybe the actor that played Preston has a girlfriend and his girlfriend probably was jealous over the actor and actress that played Preston and Sarah. And wanted Peter to be with some other girl. I feel that Brody should of been the one who should of gotten with Sandy or another girl instead of Preston. To me it was the writers way of getting Brody and Sarah together instead of Preston and Sarah together or Levi and Sarah together. Yeah, they’ve had a lot of nice moments. But I guess since they already had Hayley and Calvin, they didn’t want to focus on another couple? Well yeah I guess you’re right, but I still say that Preston and Sarah belong to just like in Power Rangers Zeo it was hinted that Adam and Tanya liked each other the writers didn’t send another girl in the mix for Adam and ruin the possibility of Adam and Tanya to get together. They’ve just kept that idea of them liking each not set Adam up with another girl like they did for Preston instead of Brody.